Location: Adams Mill Access Site is located northeast of Cutler on County Road 50 E.
About 1/2 to 1 mile east of Cutler is County Road 50 E; go north on CR 50 East 1/2 mile to Adams Mill. Parking: There is a gravel parking lot with room for about 10-20 vehicles. 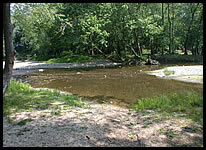 Path to River: There is a 30-50 yard carry to the creek that is relatively easy. There is access both above and below the small dam at this location. River Access: There is a very large area below the dam for loading/unloading boats, and there is room to load many boats at a time. Directly above the dam there is room to load/unload only a couple of boats at a time. The Adams Mill access point closes at sunset. Operated by the Indiana Department of Natural Resources, the access site is across the street from a nice large picnic park. The park has a portable toilet and picnic tables.